This rare vintage collection of films shows the early history of television. It shows some television manufacturing at RCA and how TV's work to receive the signal, very early production shots and techniques, and early remote control commercials. Classic Television History Films on DVD! This rare vintage collection of films shows the early history of television. It shows some television manufacturing at RCA and how TV's work to receive the signal, very early production shots and techniques, and early remote control commercials, (some silent). This rare collection is a must for any TV buff or history lover. The technology shown here is so vintage and out of date, it is quite fascinating to watch. Promotes a new console television that folds into a piece of furniture so as to conceal the all-seeing picture tube. 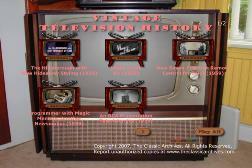 Introduces television and explains the workings of early television technology. Promotes an early version of the television remote control. Early promotional film introducing TV to the American public, probably coordinated with the rollout of scheduled broadcasting at the 1939 New York World's Fair. Shows scenes of television production at the National Broadcasting Company (NBC) studios at Rockefeller Center, New York City, using equipment manufactured by NBC's corporate parent RCA. View of the radio industry as it existed in 1940, showing potential occupations at every level. Introduces the new industry of television, emphasizing its need for specially skilled workers. Useful imagery of the electronic media in the pre-World War II era. Early technology to enable the channel-surfer. Part of a series of post-WWII job recruitment films aimed at soon-to-be ex-servicemen. Of great historical interest and reasonably accurate about television behind the scenes and in the future. Great film showing the earlier making of television, good shots of the big heavy big studio equipment they used to use. Tribute to television as servant of the public in the Cold War era.